Some episodes of The Beverly Hillbillies TV series were filmed in the area. Kimberling City is located at (36.641943, -93.424094). According to the United States Census Bureau, the city has a total area of 3.78 square miles (9.79 km2), of which, 3.42 square miles (8.86 km2) is land and 0.36 square miles (0.93 km2) is water. Kimberling City is part of the Branson, Missouri Micropolitan Statistical Area. As of the census of 2010, there were 2,400 people, 1,147 households, and 774 families residing in the city. The population density was 701.8 inhabitants per square mile (271.0/km2). There were 1,431 housing units at an average density of 418.4 per square mile (161.5/km2). The racial makeup of the city was 98.1% White, 0.2% African American, 0.4% Native American, 0.5% Asian, 0.1% from other races, and 0.7% from two or more races. Hispanic or Latino of any race were 1.3% of the population. There were 1,147 households of which 16.7% had children under the age of 18 living with them, 58.4% were married couples living together, 6.3% had a female householder with no husband present, 2.8% had a male householder with no wife present, and 32.5% were non-families. 28.3% of all households were made up of individuals and 17.2% had someone living alone who was 65 years of age or older. The average household size was 2.09 and the average family size was 2.53. The median age in the city was 57.1 years. 14.4% of residents were under the age of 18; 4% were between the ages of 18 and 24; 15.1% were from 25 to 44; 31.2% were from 45 to 64; and 35.4% were 65 years of age or older. The gender makeup of the city was 46.8% male and 53.2% female. As of the census of 2000, there were 2,253 people, 1,045 households, and 760 families residing in the city. The population density was 673.6 people per square mile (260.4/km²). There were 1,236 housing units at an average density of 369.5 per square mile (142.9/km²). The racial makeup of the city was 97.91% White, 0.22% African American, 0.49% Native American, 0.13% Asian, 0.09% Pacific Islander, 0.27% from other races, and 0.89% from two or more races. Hispanic or Latino of any race were 1.11% of the population. There were 1,045 households out of which 17.0% had children under the age of 18 living with them, 65.8% were married couples living together, 4.9% had a female householder with no husband present, and 27.2% were non-families. 24.1% of all households were made up of individuals and 15.1% had someone living alone who was 65 years of age or older. The average household size was 2.16 and the average family size was 2.50. In the city, the population was spread out with 15.1% under the age of 18, 4.1% from 18 to 24, 18.9% from 25 to 44, 29.0% from 45 to 64, and 32.9% who were 65 years of age or older. The median age was 54 years. For every 100 females there were 91.9 males. For every 100 females age 18 and over, there were 88.5 males. The median income for a household in the city was $36,727, and the median income for a family was $40,508. Males had a median income of $30,774 versus $18,000 for females. The per capita income for the city was $19,715. About 4.5% of families and 6.2% of the population were below the poverty line, including 10.2% of those under age 18 and 3.6% of those age 65 or over. 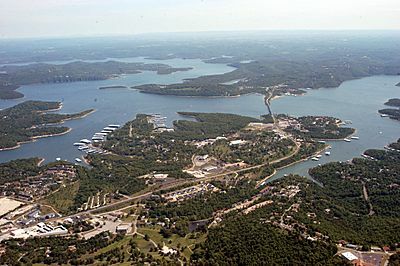 Located next to Table Rock Lake, Kimberling City is host to a novice golf course, a bowling alley and multiple attractions near the lake, such as What's Up Dock, a wharf on the lake where aquatic vehicles can be rented, and gas can be purchased. Though undermined by nearby Branson, Kimberling City is a quick stop for anyone passing through to spend a day at the lake. 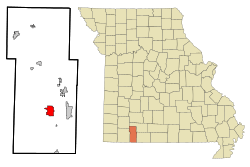 Kimberling City, Missouri Facts for Kids. Kiddle Encyclopedia.